So, it has been pointed out that there has not been much in the way of Wyrd Stone posts on Wyrd Stones and Tackle Zones lately. That has mostly been due to Mordheim not being played at all in our group, and therefore, no games to talk about and no terrain to build. 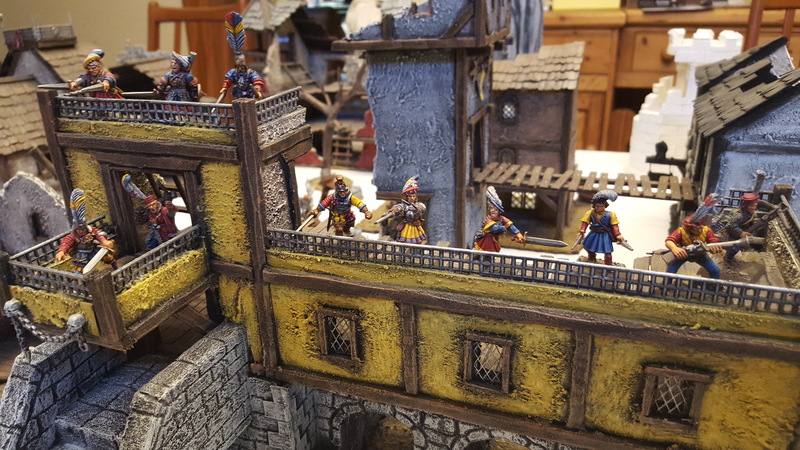 Well, luckily for us all, last week we actually played a couple of games of Mordheim in one night. So Jeff and James came over last Thursday night for some Mordheim madness. Now, we have not really played the game much at all in probably twelve years or so, but it is still a good game, and one that gets talked about pretty regularly. After discussing it more off and on for a few months, I finally declared that a full on Mordheim game night was officially on. Since we were an odd number of players, we decided on two three players games. We did not use any pre-written scenarios, we just kind of made it up as we went along. James brought his fantastic Beastmen warband (which is REALLY hard to hurt with most of the members having a 4 Toughness) and Jeff brought his Marienburgers (also painted by James which is why they also look fantastic). I brought my sad Ostlanders which are not painted at all, except for a single Hero which was done by James as well (yes, it looks amazing…). You see, the Ostlander warband can actually hire an Ogre as a Henchman AND hire an Ogre Bodyguard Hired Sword. In fact, the Ogre Bodyguard is the ONLY Hired Sword the Ostlanders can have. Now, James and Jeff were sure that adding two Ogres to the roster, thus leaving me with a smaller number of slightly less armed members would work to my disadvantage, but I figured that it was worth a try. If it did not work out, I could start over from scratch. The first game was a simple setup. We each set up in a different corner and the objective was to control a small statue terrain piece in the center for the most turns with a twelve turn limit for the game. The Beastmen are fast, but the Ogres are faster, so I knew that I could get to the objective first. The catch was Jeff’s archers. He had placed them high in a building with a perfect view of the central square. He also had a troop of models making their way towards the statue. I ran my Ogres up to within one turn’s movement of the statue, but held back to keep from getting lit up by the archers. I also knew that just on the other side of Jeff’s warband, James was coming in fast with his Beastmen. I knew Jeff and James would collide first, so my plan was to let them knock each other around a bit first, then sweep in to clean up. Right on queue, the Beastmen slammed into the Marienburgers, and the Beastmen Shaman used his magic to zoom up to the archers and engage them. 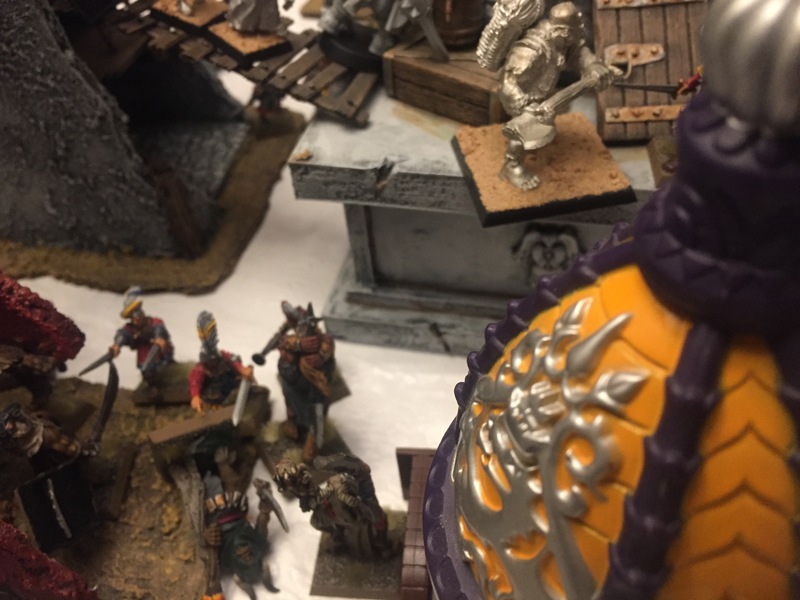 With the missile threat mostly nullified, the Ogres ran in to take control of the statue while waiting for a second group of Beastmen to come in from the opposite side. Jeff and James slugged it out for a couple of turns with the Beastmen generally getting the best out of the exchanges, though they did not emerge unscathed. At this point, the second troop of Beastmen were close enough to be a threat and so the Ogres closed in with the rest of the Ostlander warband taking control of the statue. The Beastmen have a high Toughness, but the Ogres, both armed with two axes were able to make short work of their foes. After that the Ogres made their way back to the objective where one of them ALMOST got taken out of action by the Beastmen who were now freed up from their engagement with the Marienburgers. Luckily, support arrived in time to rebuff the attack and my Ostlanders retained control of the statue. 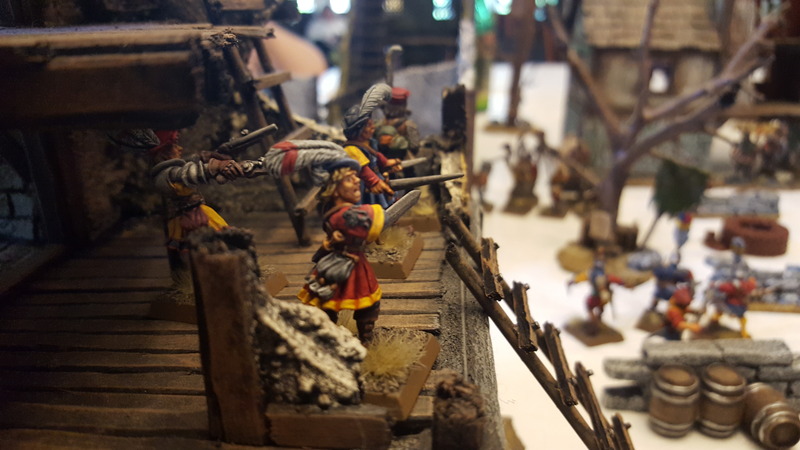 Shortly after that, with both enemy warbands down several members, the Marienburgers and Beastmen both failed route tests and the game was over without the Ostlanders having a single member go Out of Action. The dual Ogre concept was proven valid in the first exchange. We started and James ran towards the center, while Jeff sent about half his forces along the walkway. I ran both Ogres along the other end of the walkway with the intent of catching the Marienburgers on the Statue of the Damned. The plan worked perfectly and both Ogres chewed through Marienburger archers while the leaders below watched in horror as the Beastmen hoard was bearing down on them without their covering fire. The Ostlander Captain fired an arrow or two, but to little effect. The main Beastmen contingent engaged the Marienburgers while a small group ran up a ladder to get to the third end of the walkway to try and take the Ostlanders from behind. By this point, there was nothing left of the Marienburger archers, though a Henchman armed with a Blunderbuss managed to take a wound or two off of one of the Ogres. 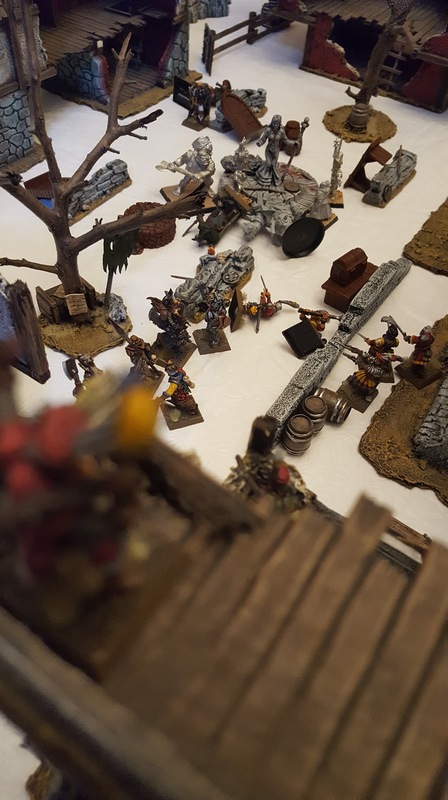 With the Beastmen trying to attack from behind, the Ogres made a quick dash to the only entry point from the walkway into the building the Ostlanders were controlling. They were able to stop the Beastmen just in time and proceeded to knock each one off of the third story of the building one by one. It was at this point with the Marienburgers and the Beastmen again down a number of models that the Marieburgers failed their second route test of the night, and the Beastmen voluntarily routed giving the Ostlanders their second win. I originally thought that having two Ogres on the roster would be very risky and having so few minis (seven in all) in the warband would really work against me. In practice, at least for this night though, the Ogres were absolutely the rock stars of the warband. They soaked up all the attacks, which is fine since they both have 3 Wounds, and they dished out their fair share of punishment. They also managed to leave enough fodder for the Heroes to get their fair share of experience points in both battles. Most importantly, I survived both battles without having a single mini go Out of Action. I think they have proven their worth and I will continue to pay the upkeep for the Ogre Bodyguard to keep him on the roster. 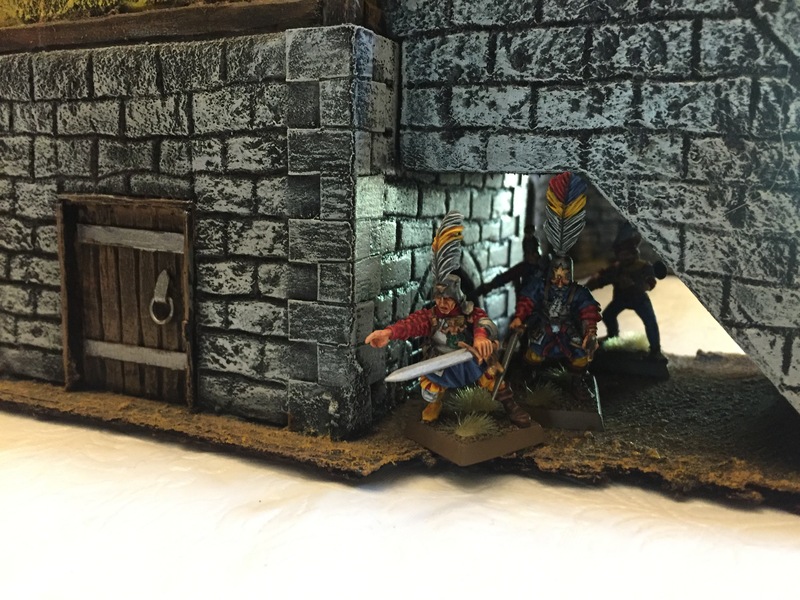 This entry was posted in Gaming, Mordheim and tagged Games Workshop, gaming, Miniatures, Mordheim, table-top games, tabletop wargames, wargames, Wargaming by Mike C. Bookmark the permalink. Sounds like fun. 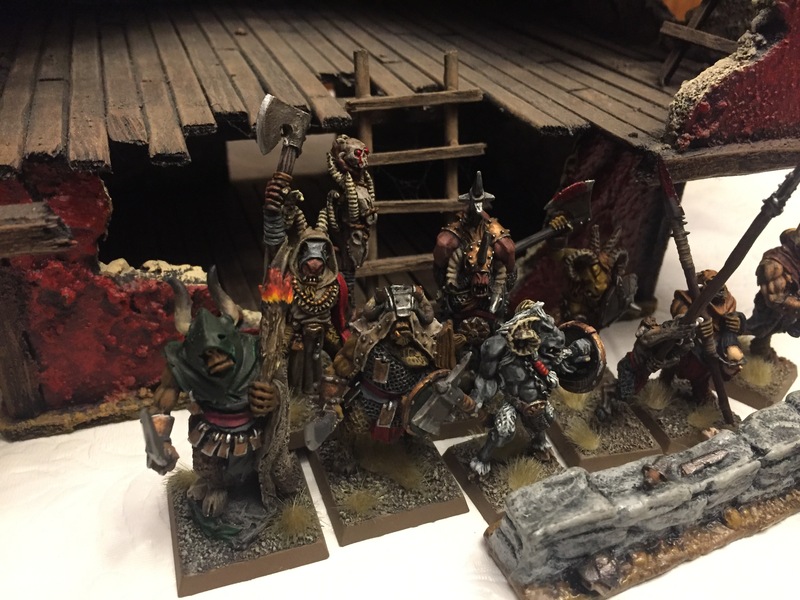 I’m so in love with Mordheim terrain. Yeah, I enjoy building terrain MUCH more than painting minis. It is actually my favorite part of the hobby. I just have not had much reason to build terrain in the last couple of years. Seems you had a good time and your terrain setup looks stunning.